This Giving Tuesday, help families in need save money, protect their environment, and breathe clean air! As the Thanksgiving holiday comes to an end, I am thankful that I was able to enjoy a delicious home-cooked meal with my family. But at Solar Household Energy we know that for nearly half of the world’s population, feeding their families – for mere survival, not for Thanksgiving feasts! – is a daily struggle that impacts their health and livelihoods. Collecting firewood and other biomass fuel can be back-breaking and dangerous labor. Fuelwood purchases can consume a significant portion of families’ income. Cooking over unimproved cookstoves fills the lungs of women and children with intoxicating smoke. The World Health Organization estimates that over 4 million people die prematurely from illness attributable to the household air pollution from cooking with solid fuels. 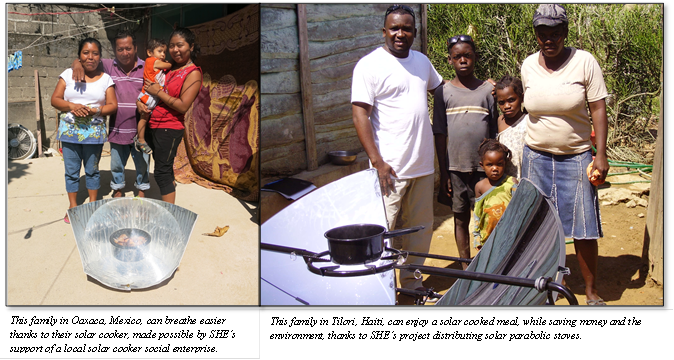 Solar cookers offer an affordable, clean, and fuel-free alternative. Your gift will help provide solar cookers to families in rural Mexico recently devastated by the earthquake, Haiti towns in deforested areas, and refugee camps in Chad, so that they too may enjoy a healthy, easily prepared meal. Please make your financial gift today to help these families. ← SHE Co-founder Louise Meyer wins Leaders in Energy Award!